The Arctic Cat 90 picks up the Alterra name for 2017. It shares the DVX 90 engine and frame, but it is styled as a mini version of an Arctic Cat utility ATV. Cargo racks are on the front and rear of the little machine, and its single-Aarm front suspension with swingarm rear suspension help it carry up to 25 pounds between the two racks. The DS 90 shares the same frame and engine platform as the DS 70, but the 90 is more powerful. The automatic CVT transmission makes this Can-Am easy to operate, and there is a built-in throttle limiter. Single-A-arm-type front suspension has 3.4 inches of travel, while a swingarm rear suspension provides 6.3 inches of travel. Can-Am’s DS 90 X is more sport-oriented and wider (43.7 inches) than the DS 90 (35 inches) to give it a more stable ride for higher speeds. While the 89.5cc, single-cylinder, four-stroke motor isn’t the fastest youth ATV mill around, it is enough to compete with. The DS 90 X comes with an aluminum front bumper/number plate and nerf bars. The Axis and Forge 110 share the same little four-stroke 108cc engine that is fuel-injected. An automatic CVT-style transmission helps put the power to the rear wheels for your youth to have a good time riding the trails. The Forge is designed to look like a big 4×4 utility ATV. It has front and rear cargo racks. Honda’s youth, four-speed, auto-clutch ATV is fun. The engine is a SOHC, 86cc, air-cooled, single-cylinder fourstroke that is chain-driven to a rear axle with 2.6 inches of wheel travel. The front independent suspension has 2.6 inches of travel, and dual-sealed drum brakes help slow the Honda TRX90X down with a single drum brake in the rear. You can get the youth machine in red and olive green. Kawasaki has the smaller youth market covered with the KFX50. It utilizes a 49.5cc, single-cylinder, four-stroke engine mated to an automatic transmission with electric start or a kickstarter. There is a throttle limiter and an engine-stop lanyard for helping parents teaching their kids how to ride. Drum brakes slow this little Kawasaki down. Another great youth machine is the Kawasaki KFX90. It runs an 89cc, single-cylinder, four-stroke powerplant paired with an automatic CVT. Just like the KFX50, it has a built-in throttle limiter and can be started electronically or through a backup kickstarter. The front suspension is a single-A-arm type, while the rear suspension is a solid rear axle. The Mongoose S 90 is rated for kids that are 10 years old and up. The little ATV is electronically started and has a smooth CVT transmission with reverse. A throttle limiter comes on the machine so you can set your youth’s speed. The suspension has spring-preload adjustments to set a smooth ride. This little fun machine is rated for kids who are 6 years of age and up. It comes with a throttle limiter and safety tether. An easy-to-use push-button starting system comes on the 70S, as well as a back-up kickstarter. The little, 69cc, single-cylinder, four-stroke engine packs enough fun for any young one who wants to shred some trails. Riders who are 10 years of age or older can pilot this little fuel-injected 112cc Outlaw. Single-A-arm suspension softens the ride up front, while a rear swingarm with 6 inches of suspension travel keeps the ride smooth. The brakes are four-wheel drum, and parents can adjust the throttle to keep their child riding at a safe speed. 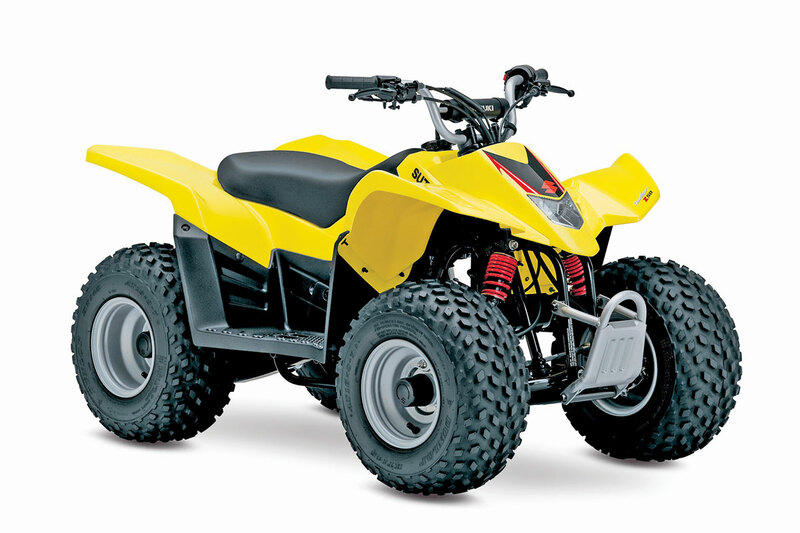 Suzuki’s smallest quad is the QuadSport Z50 for riders aged 6 and older. The engine is a carbureted 49cc aircooled single-cylinder mated to a CVT. The front suspension is a single-A-arm type, while the rear utilizes a solid-axle swingarm. The brakes are dual drum up front and a single drum brake in the rear. Yellow is the only color. Working off of the DNA of the older Suzuki LT80, the QuadSport Z90 is a great kids’ quad but uses new technology. The engine is a carbureted, single-cylinder fourstroke paired with a CVT. It shares similar sporty styling to its older brother, the QuadSport Z400. It’s rated for ages 12 and up, and it has a built-in throttle limiter. The 2017 Yamaha YFZ50 is a new edition. The youth quad sports a 49cc, single-cylinder engine that is aircooled and carbureted. It starts via an electric or a backup kickstarter. The hand controls are designed for small hands, and there is a built-in throttle limiter, along with a power cut-off tether. This youth quad takes style tips from the Raptor 700. While the engine is much smaller for child fun, it still packs a little punch. The Raptor 90 uses a 90cc, single-cylinder, four-stroke engine paired with automatic CVT, which makes riding the little quad easy for kids. There is a builtin throttle limiter, and it comes in blue or white.